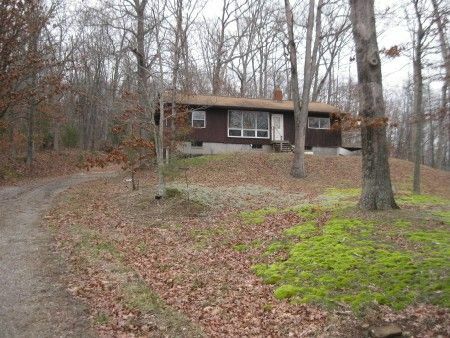 What an impressive wooded setting for this small, cozy one floor plan home! The house consists of an open kitchen-living room combo with built-in oven, cabinetry, hardwood floors and a breakfast bar. The 2 bedrooms have closets & one of the bedrooms has it's own deck. The full bath has shower over tub, the rear covered deck is a great place to enjoy wildlife and the basement is divided into three rooms; the family room has an exposed brick fireplace. 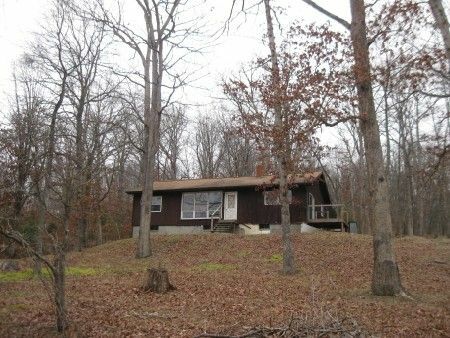 The home offers County water, septic tank, 200 amp breaker box, shingle roof all on a block foundation. Real Estate Terms: $10,000 Minimum Bid; $2,000 down at time of sale; balance in cash or check at closing on/before May 19, 2012; taxed prorated to closing; offered free & clear prior to closing.